Truth: a.) Carbon dioxide is a minor player in any further warming. It is uniformly distributed in the atmosphere but only absorbs infrared (heat) in a very narrow wavelength range. The CO2 wavelength range is outside the range of most of the solar radiance that penetrates our atmosphere. It falls roughly inside the wavelength range of temperatures re-radiated when solar radiation heats the Earth’s surface. The atmospheric CO2 already absorbs almost all of the radiation that it can in that wavelength range. Most of the warming effect of CO2 has already occurred in the past and is one of the reasons our planet is not a frozen wasteland. Any increase in CO2 will have a very minor effect. With CO2 absorption near saturation, almost all of the re-radiated heat in that wavelength range is already being trapped, so it can have little or no effect on future increases in temperature or supposed forcing of water vapor. (will be explained in claim 3 analysis in future posts.) With CO2 essentially eliminated as a source, any increase in temperature must be from other sources. This figure above requires a bit of explaining. The top spectrum shows the wavelengths at which the atmosphere transmits light and heat as well as the blackbody idealized curves for no absorption. It is a little misleading because the data is not based on actual solar and earth data. 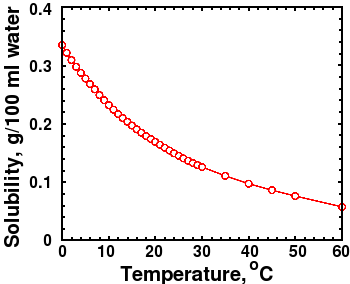 It is based on two experimental heat sources, one centered at 5525 K (5252o C or 9485o F), the approximate temperature of solar radiation, and one centered in the range of 210 to 310 K (-63o C to 36.8o C or -82oF to 98o F), the approximate temperature range of re-radiated heat from the earth. In reality, solar radiation power, (Watts/m2/micron), is six million times as strong as the power of re-radiated heat from the Earth. The other spectra are absorption spectra. 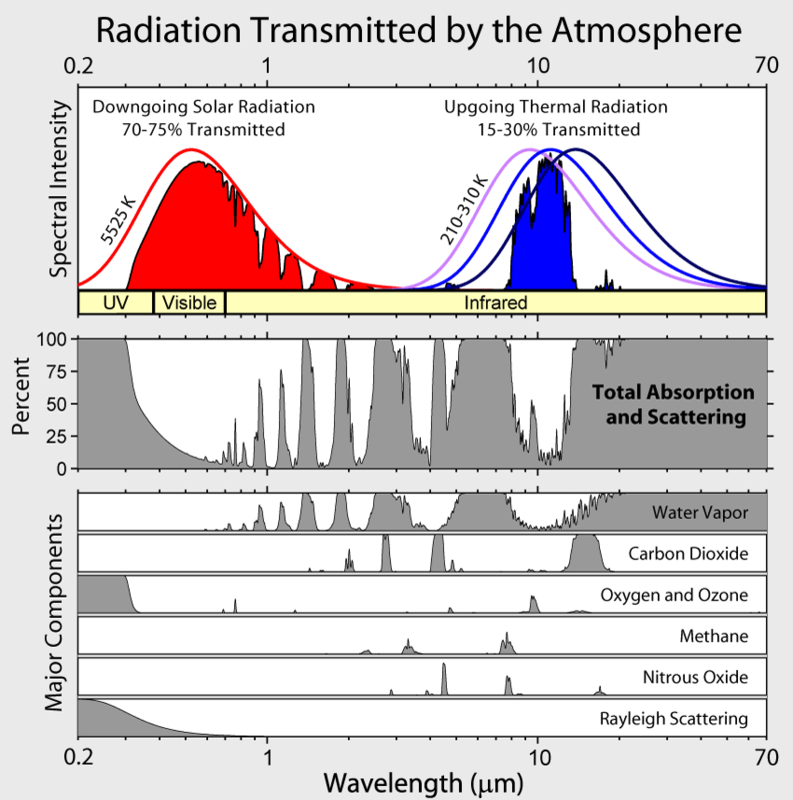 The first one shows the relative percent absorption by total atmospheric gases at various wavelengths, (note that this spectrum is practically the inverse of the transmission spectrum above it), and the spectra below that show the absorption wavelength ranges of individual atmospheric gases, (but not the relative strength of that absorption in reality). As experimental, not real atmospheric, data they can only tell us the wavelength ranges of the absorption, not their relative strengths in the atmosphere. Note that CO2 absorbs in the 15 micron range, which is within both the range of re-radiated heat and the strong absorption by water vapor, of which the CO2 peak forms a mere shoulder. CO2, in the atmosphere is evenly distributed and is near-saturation level at this wavelength. That means that little if any re-radiated heat can escape through the blanket of CO2, which is why our earth is not a frozen wasteland. This also mean that adding more CO2 will have little effect on future temperatures. Lesser CO2 peaks in the 2.7 and 4.3 micron ranges only contribute in a minor way. The first is completely covered by a water vapor absorption peak and the second forms a shoulder in another water vapor peak. These minor peaks occur in a region where both solar radiation and re-radiation are minimized. Methane and nitrous oxide are also shown to be minor players, having narrow absorption ranges and are at low concentrations in the atmosphere. Note too that ozone blocks most of the ultraviolet light from the sun. b.) Water is by far the most important greenhouse gas/liquid in the form of vapor, high and low altitude clouds, rain and snow, which both absorb and reflect in-coming sunlight and re-radiated heat from the surface. Water vapor is not uniformly distributed in the atmosphere, being concentrated near the earth, it strongly absorbs heat in a wide range of wavelengths. More heat means more water vapor evaporating from the oceans. Sounds pretty scary, doesn’t it? Contrary to what is assumed by climate modelers, who use this to claim forcing by CO2, the extra vapor doesn’t remain as vapor. It quickly forms low altitude clouds that strongly reflect in-coming sunlight and heat into space. Any re-radiated heat from the surface that may be trapped by clouds is a small fraction compared to the in-coming solar radiation, so blocking solar radiation has a net cooling effect that overwhelms any increases in trapped re-radiation. High altitude clouds tend to trap heat from being re-radiated into space, but have little effect because the increases in cloud cover due to warming are mostly in low altitude clouds. c.) Methane, like CO2, only absorbs heat in narrow wavelength ranges far from most of solar heat radiance, so that water, with its broad absorbance spectrum, trumps all other greenhouse gases. Like CO2, methane is at or near its absorbance saturation point in the atmosphere so that increases would have little effect. While it is true that continued warming could result in release of methane from melting permafrost, it would have a relatively minor effect on global temperatures. Methane is derived mostly from decaying organic material and from natural seeps on the land and under the sea, as well as termites and ruminant flatulence. Methane absorbs 29 times as much heat per volume as carbon dioxide but at 1.8 ppbv, (.00000018 percent), compared to CO2 at 380 ppmv, (0.038 percent), it is recognized as a minor player in greenhouse warming along with Ozone (O3) and Nitrous Oxide (N2O). d.) Manmade carbon dioxide is estimated to be about 5 percent (1/20th) of the total CO2 emitted. Animals and man are relatively minor contributors. Decaying organic matter is the major source, followed by volcanic activity and release from warmer oceans. Warmer water releases more CO2 than cooler water due to decreased solubility of CO2 with rising temperature. Many studies show that atmospheric CO2 concentration rises AFTER warming, not before. So which is the cause and which is the effect? See next post for the beneficial effects of CO2 on plant life. Transmission and Absorption are inversely related by the formula A = 1/log T.
 The horizontal axis is a log scale in microns so that the 1 to 10 range is in units of 1 and the 10 to 70 range is in tens. Ppbv stands for parts per billion by volume. Ppmv stands for parts per million by volume.